Social Psychology is the study of human behavior in social situations. The specialization focuses on topics including emotion, aggression, and social cognition. It also encompasses applied social psychology, including psychology and the law and behavioral medicine. Experimental psychology uses scientific tools and concepts: knowledge of formal systems such as logic or calculus, probability theory, computer science, chemistry, biology, physics, and statistics. 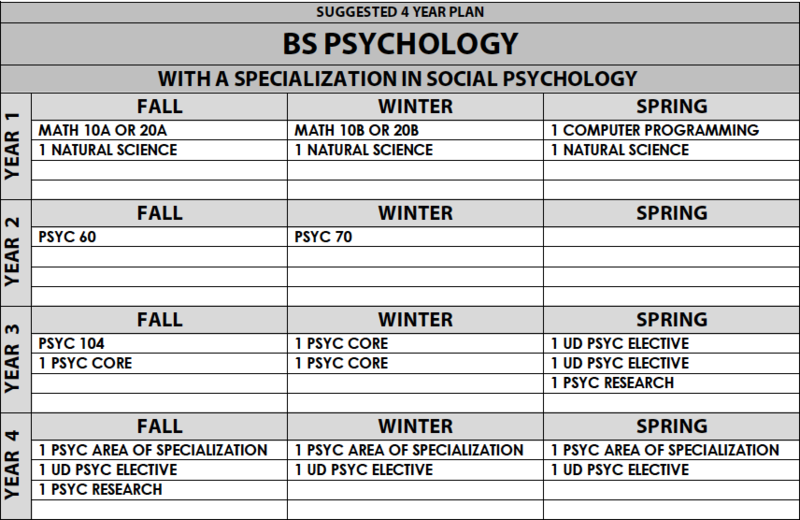 Accordingly, students in upper-division courses must have an adequate background in these topics. **Students who are interested in fields that may require advanced calculus are advised to take the MATH 20 series to fulfill their formal skills requirement. **If the research experience requirement is fully satisfied by PSYC 99 and/or 199, one of these must culminate in a research paper approved by the faculty advisor and submitted to the Psychology Student Affairs Office no later than 3:00 PM Thursday of the final exam week of the student's graduating quarter. Failure to submit your BS research paper by the deadline delays your official graduation term to the following quarter.